Why does water always take a winding course in streams and rivers? Do common principles and rhythms underlie its movement - whether it be in the sea, in a plant, or even in the blood of a human being? In this seminal and thought-provoking work, the laws apparent in the subtle patterns of water in movement are shown to be the same as those perceptible in the shaping of bones, muscles and a myriad of other forms in nature. 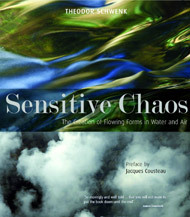 Fully illustrated, Sensitive Chaos reveals the unifying forces that underlie all living things. The author observes and explains such phenomena as the flight of birds, the formation of internal organs such as the heart, eye and ear, as well as mountain ranges and river deltas, weather and space patterns, and even the formation of the human embryo. A perennial bestseller since publication, Sensitive Chaos is an essential book for anyone interested in the mysteries of life on earth. THEODOR SCHWENK (1910-1986) was a pioneer in water research. He founded the Institute for Flow Sciences for the scientific study of water's movement and its life-promoting forces. A prolific writer and lecturer, he contributed original insights to the production of homeopathic and anthroposophic medicines, developed 'drop-pictures' for analysing water quality and methods for healing polluted and 'dead' water.